Flexible IM fixation of femoral fractures is the best fixation for most fractures in ages 6 to the end of growth. Contraindications include comminution and unstable fracture patterns, or unacceptable anesthetic risk. Evaluate the fracture. Place leg in Buck traction to provide alignment and immobilization while awaiting operative stabilization. Assess for other injuries, hip, knee, neurovascular status. Assess family situation and advise regarding management choices. Basic choices include Nancy nails of titanium that are most flexible, Ender nails with fenestrated end for easy extraction, and Rush rods with beveled tip and hooked end. 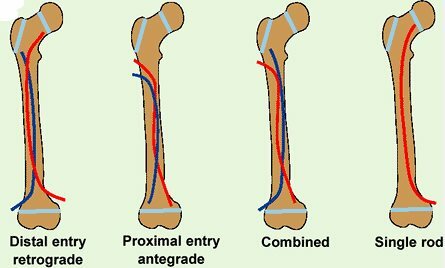 Make certain length and diameter are suitable for femur size. Generally, two nails are placed. Consider placing a third nail in a large adolescent. Make available appropriate imaging. Retrograde nailing is suitable for most fractures. Antegrade nailing is necessary for distal fractures. Single rod fixation may be adequate for the small child or may be supplemented with a single-hip walking cast. Position and drape with limb freely moveable. Apply traction to align the limb. Select nails of appropriate diameter and length and prebend. Make small stab incisions at sites for nail entry. Make certain the sites avoid injury to the epiphyseal plate. Drill the cortical window at sites of rod entry. Place both rods and alternately advance through medullary canal. Make certain rods extend far enough to provide adequate fixation. Adjust length so ends of rods are outside the cortex to facilitate removal. Ender nails may be fixed to the metaphysis with a screw to prevent migration. Nails may be left longer to make removal easier, but may be prominent enough to become irritated in the months following fixation. Document fixation with an AP and lateral long radiographs. Apply a single-hip spica cast to supplement single nail fixation as necessary. Make certain the cast is well padded about the knee. Lightweight fiberglass single-hip spica casts allow considerable mobility, usually permitting the child to return to school. If the cast is applied with the hip and knee flexed about 20 degrees, the cast may end at the ankle, leaving the foot free for shoes. Early discharge from the hospital is feasible. See in clinic in 1 week for initial assessment. See monthly until union is complete. Plan nail removal about 4–6 months. Allow return to sports about 1 month following hardware removal. Removal is simple if the end is left long. Special extractors facilitate nail removal. Complications are uncommon following this procedure. Discomfort from prominent rod end or rarely from migration of the rod is the most common problem. This irritation is usually not serious enough to require repositioning of the rod. Reducing the child’s activities may be adequate to control the pain. Loss of position may occur from shortening due to unrecognized communition or an additional injury before union.